Steve Angello has just revealed the anticipated street date for his debut album. Late last year Angello ditched Columbia Records to take the independent route for his first foray into the full length arena. 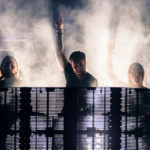 The album, dubbed “Wild Youth,” kicked off with a single of the same name that saw the former Swedish House Mafia member returning to his electronic roots. Earlier today Steve responded to an inquisitive fan on Twitter and revealed that the album would be officially released in April of 2015. Additional details are scarce but it appears that fans of the SIZE Records head honcho have only a few months to wait for his long play debut.